ChemStores comply with NZ Standards 8409:2004, making it easy for you to meet your chemical storage obligations under this act. 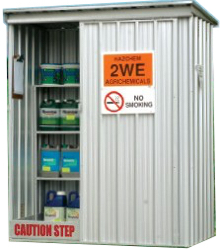 ChemStores come with everything you need to store your chemicals safely and securely. Learn more about ChemStore’s features. Delivery is FREE for all ChemStores. They are also shipped as panels, not pieces, so installation is quick and easy saving you time and money. ChemSores are available in a range of sizes to suit most requirements. 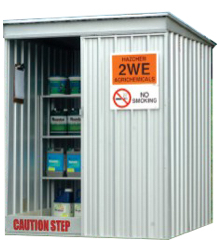 All ChemStores are NZS8409:2004 compliant. 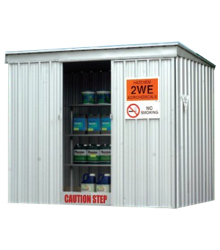 Our outdoor units range in capacities from 400L through to 950L. They have been designed to provide a practical and flexible Agrichemical storage solution. 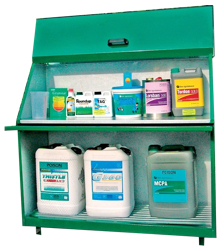 The ChemStore Mini-Cabinet, with its integrated mixing shelf, is an indoor storage solution with a capacity of 220L. Find out more about ChemStores’ many features here. The HSNO Act 1996 is now enforcable and non-compliance is a finable offence. For free advice call us toll free on 0800 22 55 15.